You know what all these guys had in common? (Well, besides a gene pool and a fish dinner.) They all liked cake. And, they all liked bacon. 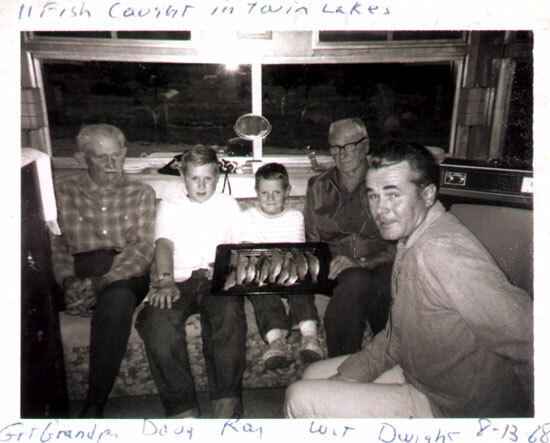 These “Hardy Ancestors” posts are dedicated to recipes that had their best days a lifetime ago, with my great-grandfather (an HA if there ever was one) at the far left on the sofa. Days when food was abundant if you didn’t mind the lack of variety, and work was hard and long enough that you didn’t. And then there was dessert. Mix the bacon fat with the boiling water. Stir, and when slightly cooled add the egg and sugars. Add to the dry ingredients and mix well. Place into a greased 8 x 8 pan an bake 35 to 40 minutes at 350. Serve with whipped cream. I like to add chopped apples or raisins, and I use the pan drippings from our best pepper bacon for extra kick. Bon appetit! This entry was posted in dessert, ethnic, recipe, Uncategorized and tagged autumn, cake, dessert, hardy ancestors, harvest, heritage, kitchen, recipe on October 7, 2009 by APo. “They all liked bacon. And, they all liked cake.” Hmmm, where is this going? I didn’t dare hope for bacon cake, yet here you are! And apples & bacon, yum!